Your very first night as husband and wife will probably be one of the most important times in your life. But where do you plan to celebrate this special time? Most couples splurge on a honeymoon suite or wedding suite to launch the beginning of their married life. What Is a Honeymoon Suite? A honeymoon suite can really refer to any room or collection of rooms in which a newly married couple stays. In most cases, it’s a deluxe size apartment area within a hotel, resort or bed and breakfast. Often such a hotel honeymoon suite will include a sleeping room, a sitting area and one or two bathrooms, although more extravagant options also exist. 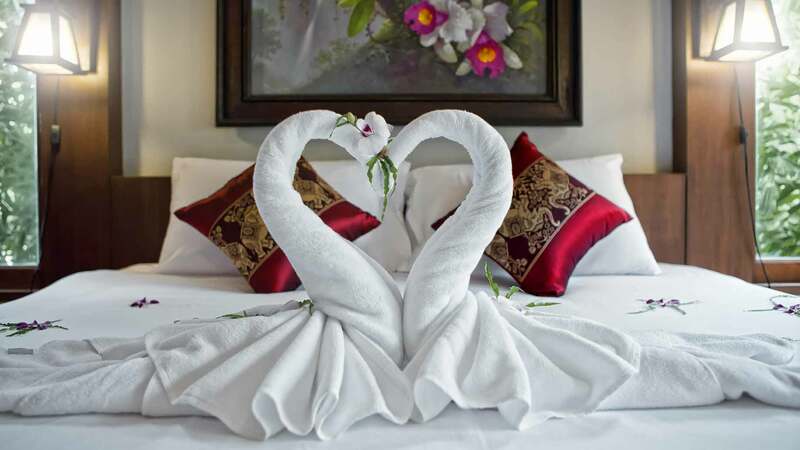 Some hotels have a designated suite that’s reserved exclusively for newlyweds and comes complete with special romantic details like a heart shaped bed or tub. Other hotels have a luxurious suite (or multiple suites) that they can personalize for newlyweds with romantic touches and extras to meet their specific preferences and desires. How extravagant the honeymoon suite offerings are will usually depend on the caliber of the hotel. For instance, keep in mind that if you select a honeymoon suite in a budget hotel, this may in fact end up being a basic single room with a bottle of champagne provided. On the other extreme, a honeymoon suite in a high-end hotel can be a penthouse with multiple rooms, high-end furniture, and extravagances like a huge balcony, private pool, expensive artwork, and even a screening room. The higher end hotels also offer exceptional services for honeymooners, indulging their every whim. In fact, some hotels will even make a butler and limousine available to serve the newlyweds, or the use of a high-end sports car. They also offer access to exclusive beaches and many more exclusive luxuries. Keep in mind that most bridal suites fall somewhere in between these two extremes. Some of the more typical types of special effects you can find in a basic honeymoon suite include having the bed covered with rose petals, serving a bottle of champagne with chocolate covered strawberries, delivering breakfast in bed, providing luxurious his and her robes, and full offering massages and other spa treatments to make the newlyweds feel pampered during this special time. Some of the favorite spots for newlywed suites or wedding suites includes Las Vegas, Sonoma Valley, New York City, Maui, Orlando/Disney World, a cruise to the Caribbean, Bermuda, Jamaica, Paris, London and Tuscany, among many other honeymoon hot spots to try. Once you select your destination, you can ask your travel agent to find you some honeymoon suite options, or you can shop yourself for wedding suites online. There are a number of travel services you can access that provide discounted rates, such as Orbitz, Expedia, Travelocity, Hotels.com, and Trip Advisor, Frommers, and Lonely Planet can also be helpful sources of travel reviews and information. If you love the idea of a bridal suite but are worried that you can’t stretch your budget to enjoy this luxury, the good news is that it doesn’t have to be all or nothing. You can still plan a honeymoon but do it economy style, selecting more reasonably priced accommodations or special package deals that give you standard rooms at affordable rates. In addition, if you have your heart set on experiencing the very best but you don’t have the budget to match your taste, one wedding planner advises couples to stay in the nicest hotels they can afford but in a regular room instead of the newlywed suite. You’ll be able to have access to all of the upscale amenities and still be living within your means. The timing of your honeymoon, and where you plan to go, can also make a difference in what you will spend on the honeymoon suite you select. For instance, in the middle of winter, airfare and hotel rates at most islands are at their peak since this is prime tourist time. However, during June through September, you may be able to stay in the same location for a lot less, enabling you to upgrade to a nicer hotel and a more luxurious wedding suite or room. On the other hand, an ocean-side bridal suite in New England will be priced sky high during the summer time. Therefore, you may need to adjust your timing to meet your budget and goals. Of course, you may not want to change your wedding date in order to get the best airfare and hotel rate, but you could decide to delay your honeymoon for a few weeks or even a month after your wedding. That way, you can still have your dream honeymoon vacation without blowing your budget. What you spend on your wedding suite will depend on your taste, your location, and the scale of what you select. If you’re getting married in a nice hotel, resort ,or bed and breakfast, the facility may throw in the honeymoon suite as part of your package deal for no extra charge. If you have to pay for the accommodations, what it will cost you for a honeymoon suite can span a very large range. On the low end, if you want to stay in a small or basic hotel or conference center, an economy honeymoon suite might cost between $100 and $200 a night. If the hotel is more upscale and/or is located in a city or in a resort destination, the price of a mid-range honeymoon suite will more likely cost between $250 and $600 a night. The amount you will pay can go up steeply from there, if you desire something extravagant for your wedding night. The best honeymoon suites available in high-end resorts and top-of-the-line hotels can cost between $650 and $2,500 a night. Some couples even pay a much higher nightly rate. Honeymoon suites in private villas, bungalows, and cottages can also be in the upper range, depending on how luxurious they are, and where they are located. In addition, some hotels may have different levels of bridal suites, ranging from simple options to decadent splurges that come equipped with over-the-top extras and services. You could expect to spend from $0 (if offered in a hotel package) to $2,500 a night on your honeymoon suite, with most couples today paying a price of $250 to$600 a night. If you’d like to splurge on a bridal suite to celebrate your wedding night but you can’t justify the expense, you might ask a few family members and close friends to chip in on a honeymoon suite as your wedding gift. In fact, a growing trend today is for couples to set up a honeymoon wedding registry, which enables them to select items related to their honeymoon, such as their airline tickets, hotel accommodations or honeymoon activities like golf, spa treatments, scuba diving, and dinner instead of registering for dishes and household gifts. To set up a honeymoon registry, you can do a search online and browse the many registry companies you will find.